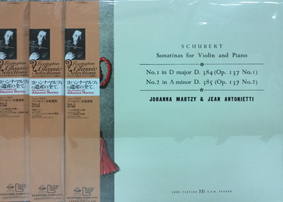 [PHILIPS/JAPAN] VIOTTI VIOLIN CONCERTOS NO.22,23/ LOLA BOBESCO..
[ALPHA/FRANCE] QUATRE JOYAUX/ LOLA BOBESCO..
[DECCA WIDE BAND/ENGLAND] MOZART SUPITER, HAFFNER SYMPYONY/ FRIPS..
[LONDON/JAPAN] SCHUBERT ARPEGGIONE SONATA.../ ROSTROPOVICH ..
[RCA/JAPAN] BEETHOVEN GUITAR CONCERTO IN D../ YAMASHITA..
[LEXINGTON/JAPAN(3LP)] SCHUBERT SONATINAS FOR VIOLIN AND PIANO/ MARTZY.. I 이용안내 Copyright (c) Since 2001. LPmadang all right reserved.